Counting down the 11 7 days to the 50th anniversary, here are my top 11 stories for each Doctor, continuing with 7 (Sylvester McCoy). McCoy was the last actor to play the Doctor in the original run of the series. 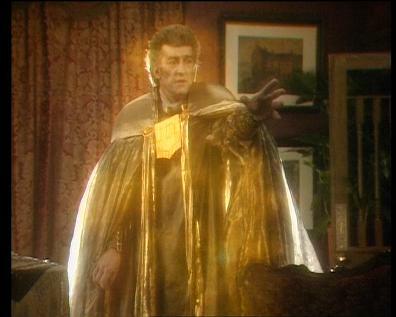 He reappeared in 1996 at the beginning of the TV movie long enough to be killed and regenerate into Paul McGann. His Doctor started out as a clown, but in the final two seasons began to display his darker, more manipulative side. 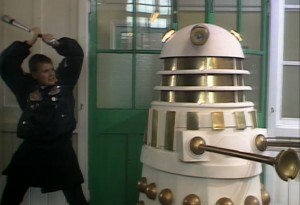 A pair of warring Dalek factions, both trying to get their hands on a powerful Time Lord device–the Hand of Omega. This one showcases how spunky the Doctor’s companion, Ace, can be as she takes a baseball bat to the dome of a Dalek (it’s been charged with energy from the Hand of Omega, but still). 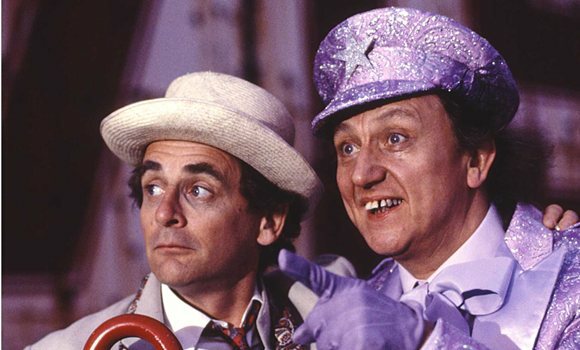 This is the first episode of the 7th Doctor’s run where he begins to show his scheming side and hints that he has more than a little to hide in his Gallifreyan past. Ah… the sound of dying. When it comes to death. Quantity is so much more satisfying than quality. An ancient evil, given the name ‘Fenric’ by Vikings, was defeated and imprisoned by the Doctor in the 3rd Century. His prison was a flask buried beneath a church on the English shore, which is now part of a naval base in World War II, where a scientist is working on the Ultima Machine, an early computer designed to break German codes…but is used to translate long-forgotten runes that lead to the release of Fenric. Vampires, mutants from the future, Soviet troops, and a scheme by the Doctor to have Ace fulfill her own timeline by saving a baby–which, unknown to her, is the mother that she hates. This one is almost too full of plot goodies. This was the last regular episode of the series before its return in 2005. 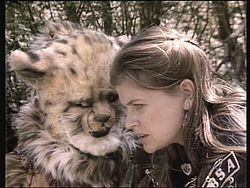 The Master has been stranded on a planet inhabited by hunters called the Cheetah People. They use cats to lure prey into a dimensional trap that brings them to their planet. 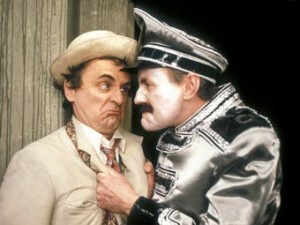 When the portal starts being used on Earth, the Master hopes to capture the Doctor and use him to help go back the other way. Scared to come to the Psychic Circus? 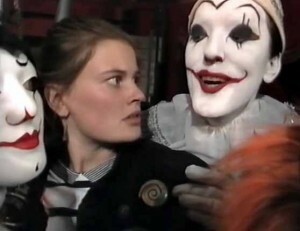 A strange circus in the middle of nowhere filled with robot clowns and led by the sinister “chief clown” is visited by the Doctor, Ace, and an assortment of strange travelers. Unfortunately for the circus patrons, it is a deadly trap where the Gods of Ragnarok destroy those who fail to entertain them. I can’t stand burnt toast. I loathe bus stations – terrible places, full of lost luggage and lost souls. And then there’s unrequited love, and tyranny, and cruelty. The Doctor brings Ace to 1883 and a house that she burned down in 1983. Turns out that thousands of years ago, an alien spaceship came to catalog all life on Earth, but one of the crew decides to imprison the others, murder Queen Victoria, and rule the world. Hail Pex. Hail the unalive who gave his life for the Towers. In life he was not a Kang, but in death he was brave and bold as a Kang should be. 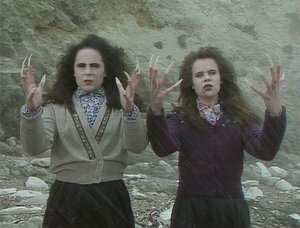 The residents of Paradise Towers are being terrorized by unexplained disappearances. Meanwhile, the Caretakers hunt wild teenage girls who have formed gangs called the Kangs (Red, Yellow, and Blue). A mysterious creature is lurking in the basement. 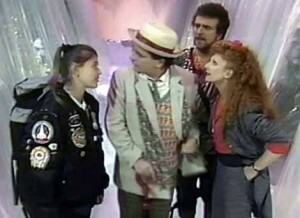 The Doctor and Mel arrive and try to sort it all out. This is a public happiness announcement. A depression is moving towards Forum Square. The proper authorities will restore harmony and peace. On the planet Terra Alpha, sadness is against the law. And it’s the job of the Happiness Patrol to enforce the law. 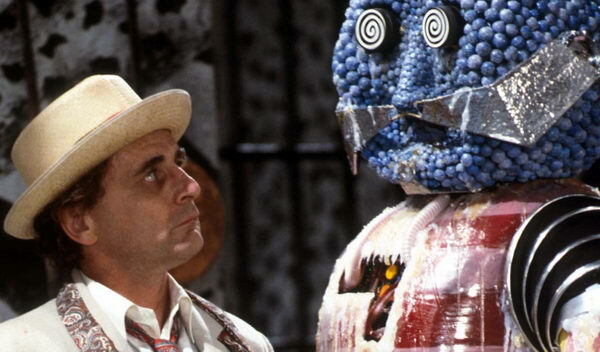 The penalty for those found guilty of unhappiness is death in a stream of molten candy prepared the robotic Kandy Man and his associate, Gilbert M. The Doctor and Mel help form a rebellion against the planet’s rulers and destroy the Kandy Man. Not really as silly as it sounds, but still pretty silly. 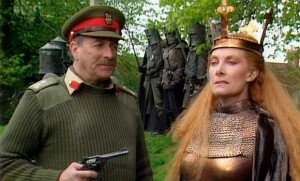 Don’t worry, Brigadier. People will be shooting at you soon. Knights from another dimension come to an English village in search of a spaceship containing the body of King Arthur and the sword Excalibur. They are followed by Mordred and Morgaine who want to claim the sword for themselves and intend on using the nuclear missile that is being transported by a UNIT convoy. Brigadier Lethbridge-Stewart comes out of retirement to help. Meanwhile, the aliens all recognize the Doctor as Merlin. It’s just… I don’t feel properly dressed without a couple of cans of nitro. On the planet Svartos, Iceworld is a trading colony. There, the Doctor and Mel unexpectedly encounter an old friend, Sabalom Glitz. Joined by Ace, a teenage waitress with a love for explosives, the group ventures off to find the fabled Dragonfire treasure. It turns out that Iceworld is really a spaceship under control of a frozen creature named Kane. This is where Ace hops on for her continuing adventures in the TARDIS and Mel leaves with Glitz. Now are you telling me that you are not the Happy Hearts Holiday Club from Bolton, but instead are spacemen in fear of an attack from some other spacemen? The last surviving Chimeron is being chased by the murderous Bannermen. They wind up hitting 1950’s Earth just as the Doctor and Mel arrive for a holiday. Meanwhile, a pair of CIA agents are trying to locate a lost satellite. Hello. I’m the Doctor. I believe you want to kill me.